He's on the loose in Kindergarten. 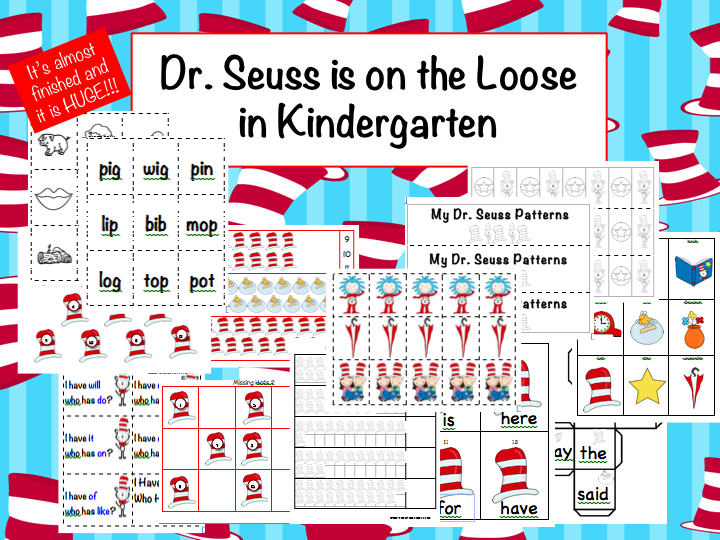 I've been working all week on my latest Dr. Seuss Math and Literacy pack and it is HUGE. I have so many ideas I can't create them fast enough. It is already 100 pages long and I'm not through yet. It will be up later today so check back- plus I'll be giving one away to a lucky blog follower. I can't wait to get this! looks great for my kiddos! oOOH, I hope I am the lucky follower that gets a pack! It looks great! It looks like a lot of fun. I would love to win this. This looks amazing! 100 pages worth of work - you should be so proud and excited! I just love Dr. Seuss - I used to teach preschool and we did an entire week on him alone. I'm looking forward to this unit! WOW! How awesome are you and this packet??!!!?? LOVE!!! WOW! Over 100 pages...you have been busy! Looks great! Can't wait to see what is all in it! I love your Dr Seuss activities. I also teach kindergarten in the Central Valley in California. I noticed you and I spell our names the same way. I have never seen it with an "i" at end. Lol In school teachers uses to spell wrong. Thanks for the great activities. I was typing so fast I left a few words out. Sorry for the previous typos.